WordPress magazine themes are perfect for those looking to start a blog and display a ton of content in a visually appealing way. Content rich sites such as news sites, community blogs, and online magazines require a solid magazine theme packed with enough features to handle large amounts of traffic, present an attractive design that encourages site exploration and thorough article reading, and yet remains fast enough to meet user experience demands and SEO search ranking requirements. Because of these strict demands, finding the perfect magazine theme to suit your individual needs can be challenging. With a heap of options available, all touting themselves as the “number one choice”, how are you to know which magazine theme is a good fit for you, your content, your imagery, and most of all, your audience? 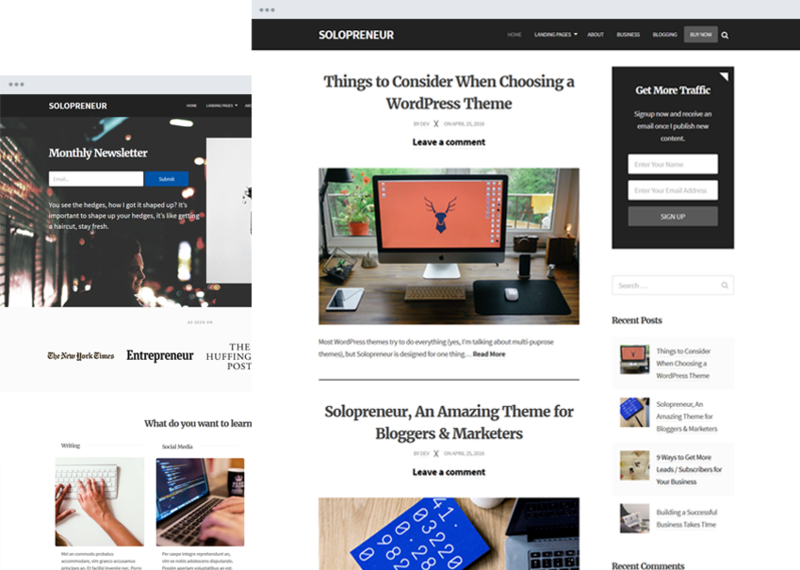 Luckily for you, we have scoured the internet looking for some of the most popular, feature-packed, and stylish WordPress magazine themes on the market today, so that you don’t have to waste endless hours scrolling through hundreds of options. All boasting a unique design, complete with organized content displays, bold imagery options, effective monetization opportunities, and of course, responsive design for those accessing breaking news on-the-go, we are convinced that somewhere in this list is the ideal magazine theme for you. Wonderwall is a clean magazine theme that has a feminine touch if need be. Featuring 7 post sliders and 11 homepage content modules, you are sure to impress site visitors from the very start. And, if you need a little inspiration, be sure to check out Wonderwall’s 9 pre-designed demos. In addition, this magazine theme offers the exclusive YellowPencil visual Style Editor for customizing every element of your website. From fonts to layouts, typography to colors, Wonderwall has you covered. Thanks to its responsive design, Wonderwall renders seamlessly on all size devices and screens. It comes with a built-in newsletter subscribe widget for building a larger following, integrated banner as locations for monetizing your website, and even social media integration for boosting social shares and adding social proof via the follower counts. 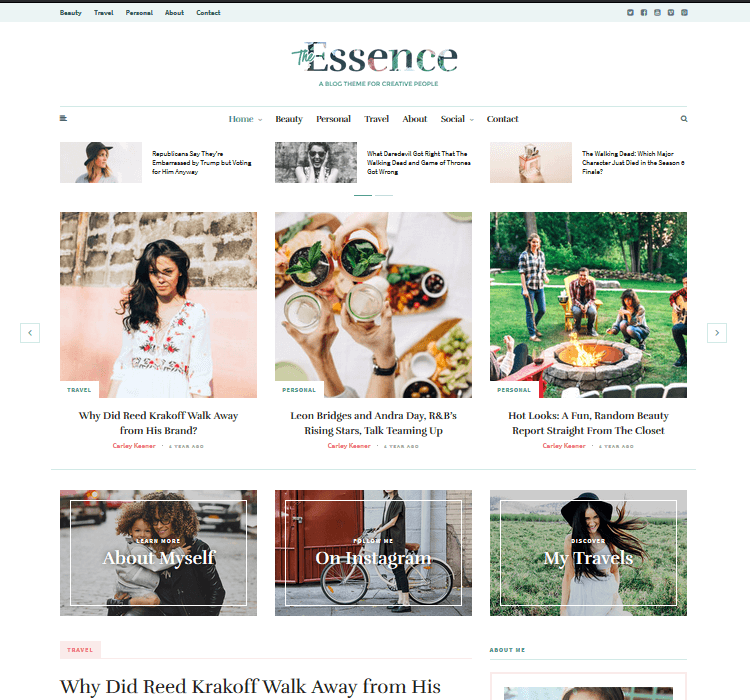 The Essence is another stunning magazine theme that’s flexible enough to cater to your female audience, or bold enough to make a statement to your diverse blog followers. Choose from 17 different blog layouts and find the perfect match for your personality and style. Elements such as columns, sidebars, and fullwidth features are available for making a visual impact on anyone that clicks on your site. Plus, add a featured slider and Instagram photos for an even better first impression. With plenty of custom widgets included, a featured posts area, and social media icons in the header for encouraging social shares and follows, The Essence takes user engagement to the max. Translate your content and build an international brand, change all site elements using the MeridianStyler on the frontend of your site, and know that no matter where your site is accessed from, it will come 100% mobile-friendly. Dahlia offers website owners a responsive magazine style layout perfect for those wanting to share a lot of content in a visually stunning way to site visitors. Plus, it provides the perfect platform for increasing subscribers and building a bigger email list. Easily connect to your favorite third-party email provider using the built-in email subscribe boxes and watch your following grow. 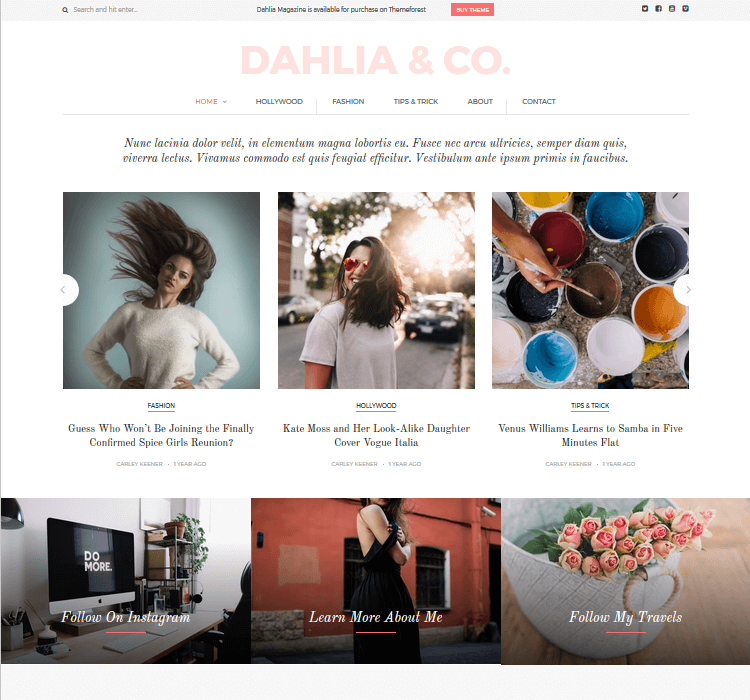 Moreover, Dahlia comes easy to set up and customize, complete with the exclusive MeridianStyler for changing every element on the frontend of your website. Introduce yourself with the stylish About Me widget, integrate social media share buttons, and include large featured images to encourage site exploration of your best content. In addition, don’t bother site visitors with annoying pagination or continuous page reloads. Instead, take advantage of Dahlia’s built-in AJAX “Load More Articles” button. 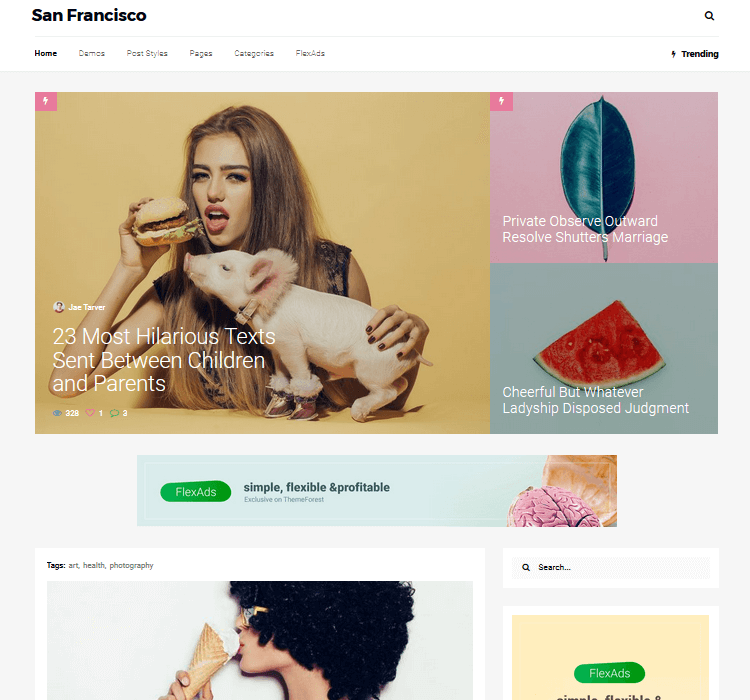 San Francisco is a modern and easy to use blogging and magazine theme designed to give website owners complete control. To start, utilize the powerful page builder to create unique pages with content modules needed to share your best stories. In addition, take inspiration from over 336 homepage variations, use the intuitive color picker for your site’s header color schemes, and rest assured your website stays fully responsive for those on-the-go. In addition, enjoy seamless ad placement for supplementing your income, SEO optimization for being found by a bigger audience base, and blazing page loading for the ultimate in user experience. Sticky sidebars, hundreds of fonts, 6 ready to use widgets, and more make San Francisco the perfect go-to magazine theme for those looking for an edgy, and cool, theme. SimpleMag comes packed with an easy to use drag & drop page builder, a configurable drop-down Mega Menu, and plenty homepage and category layout options for grabbing site visitor attention and engaging them with your content. In addition, it comes with a smart footer section that adjusts itself, and your information, based on the number on sidebars you enable. Translate your content to reach an international audience, add an eCommerce shop for added revenue, and even advertise using the strategic ad placement options SimpleMag offers website owners such as yourself. In the end, this SEO-friendly and responsive magazine theme has just enough to get your point across without overwhelming readers with too much flash and design. Flex Mag claims to be the perfect combination of power and simplicity, offering website owners a great platform for a news and magazine website. Automatically loading posts, even for those on the go, Flex Mag also comes with 9 featured posts layouts, 8 unique article layouts, and 4 pre-set skins – Sports, Entertainment, Tech, and Fashion. Additionally, it comes with WooCommerce support for setting up an online shop to sell your best products and services to loyal followers. Customize you magazine site with Google Fonts, a custom fly-out navigation option, 8 custom widgets, and sticky sidebars so your best content follows readers as they scroll down. More so, translate your content to reach a global audience, enable infinite scroll, create a forum for site visitors to interact on, and enjoy fast page loading and high search rankings thanks to SEO optimization. 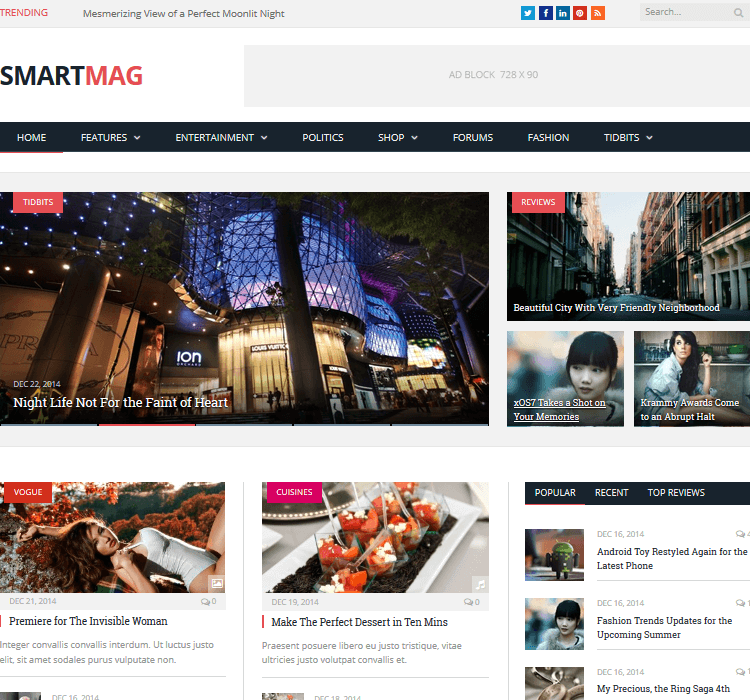 SmartMag is a modern, clean, and optimized theme, suitable for those running magazines, newspapers, review sites, or blogs. Excelling on both the back and frontends, SmartMag makes customization easy thanks to its convenient drag & drop page builder. And, on the frontend, your site visitors will experience the best when it comes to navigation, readability, and visual appeal. Choose from plenty of pre-built demos to get your site up and running in no time. More so, create a multi-page content slideshow for generating more ad views and boosting ad revenue, integrate a customized review system utilizing percentages, points, or even stars, and even create an interactive forum using the popular BBPress plugin. What’s more, SmartMag allows you to translate your site’s content, build an online shop using WooCommerce, and comes packed with tons of additional shortcodes for added site functionality. 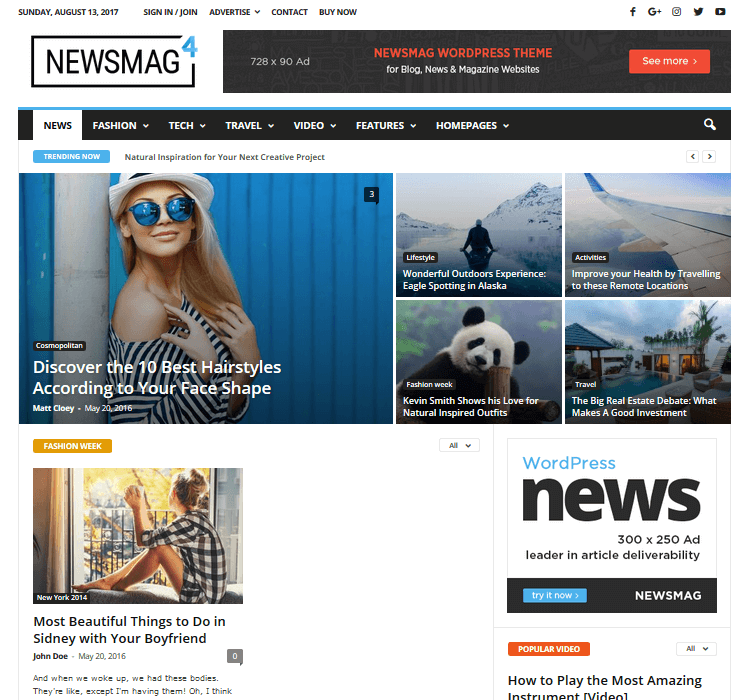 Newsmag is a WordPress theme that easily allows you to write articles and blog posts and share them with readers in a stunning, yet content-centered way. Good for those running a news, newspaper, magazine, publishing, or review site, this theme has unique features that not many other magazine themes do. For instance, Newsmag supports YouTube videos with ease and lets you implement a rating system for added user engagement. In addition, it comes fully responsive, AdSense ready, and easy to build using the exclusive tagDiv drag & drop page builder. Lightning fast page speeds, hundreds of handcrafted page elements, premium widgets, and more let you build a bigger following, add beautiful imagery to complement content, boost social sharing, and even add a bit of social proof to your website for added credibility. Plus, you can review all site changes in real time, enable a sticky menu for better site navigation, and build endless page layouts to suit your content needs. 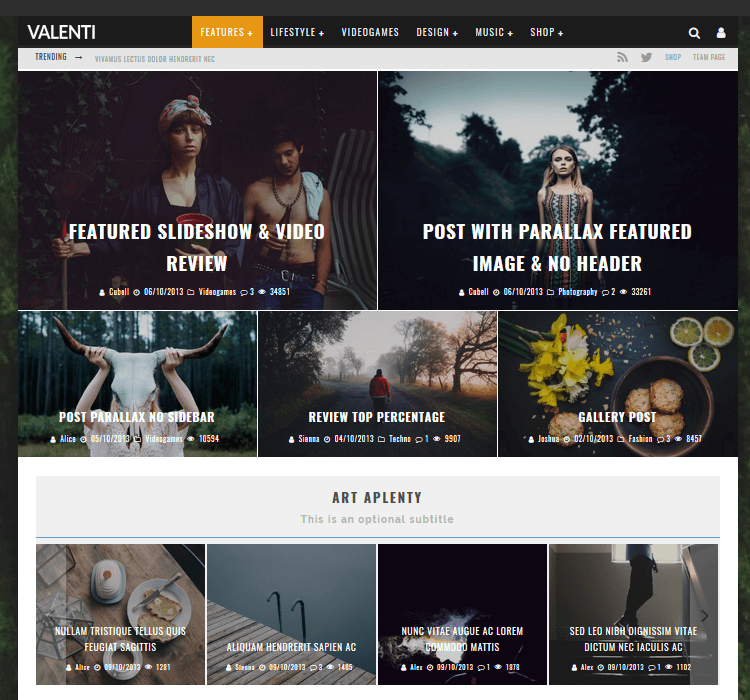 Valenti claims to be a cutting-edge WordPress magazine theme ready to get your news site on the go in minutes with the powerful Valenti drag & drop page builder. Implement an extensive review system, create unique dropdown Mega Menus, and even enable featured post images to have a smooth parallax effect for improved site appeal. Integrate BuddyPress or bbPress into your website and give readers the ultimate site experience, complete with user-to-user interaction. Upload a custom logo for increased brand recognition. Lastly, translate all of your site’s content using WPML, set up shop using WooCommerce, and add a custom sidebar, background image, or color scheme to make great first impressions on site visitors. 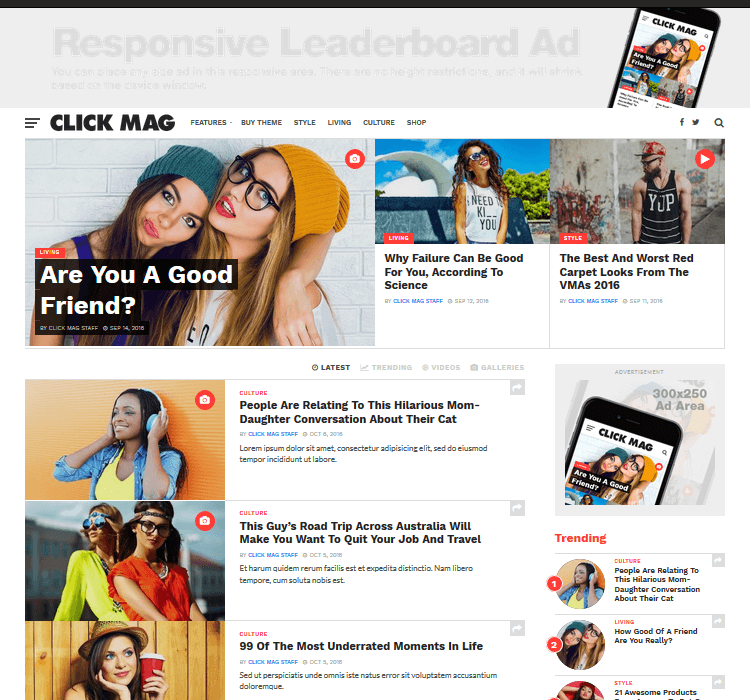 Click Mag is a WordPress magazine theme designed to maximize clicks and encourage site visitors to come to your site time and time again. To do this, it comes with premium plugins such as the Theia Post Slider for creating dynamic slideshows, the Reviewer Plugin for adding reviews and comparison tables, and the Theia Sticky Sidebar for improving site navigation. Enjoy 3 featured post layouts to match your style, add video and audio for added content variety, and supplement your income with unlimited ad units. Plus, get readers interacting via threaded comments, boost social shares with buttons, and upload your custom favicon for increased site recognition. In all, this click and content focused WordPress theme is great for those looking to capitalize on site exploration and share breaking news in the easiest way possible. 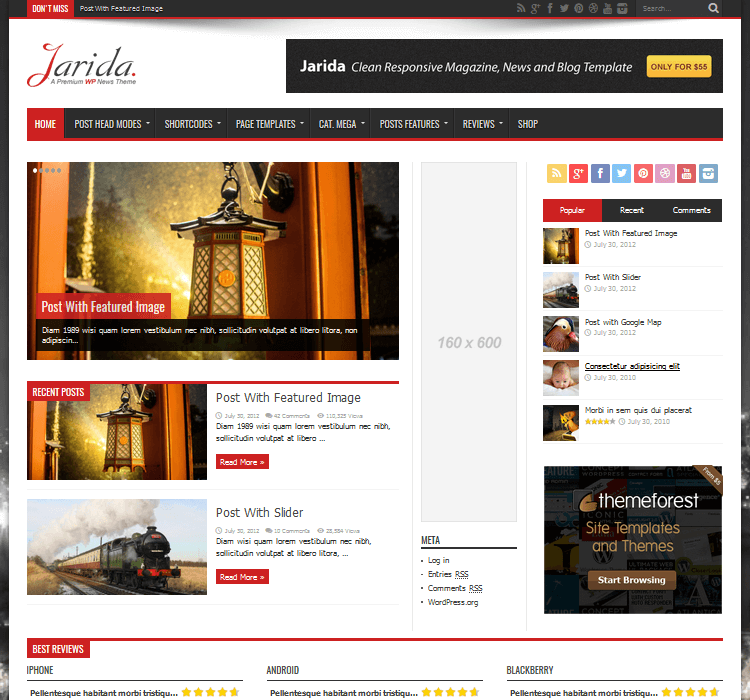 Jarida is a retina ready magazine theme that makes it easy for site visitors on all screen sizes and devices to see exactly what breaking news you have to share. It comes translation ready so you can build a global audience, and is easy to do using the popular WPML translation plugin. In addition, you can create an interactive forum using bbPress or BuddyPress, so all your readers can chime in on the latest news. Include a social counter widget for some added social proof, personalize your site with advanced typography or unlimited color schemes, and even build your homepage from scratch using the built-in drag & drop page builder. Make navigation of your magazine site easy with the Mega Menu category links, integrate several custom page templates for things such as a sitemap page, authors list, or even a login page, and even create a review system so site visitors can make their opinion known. 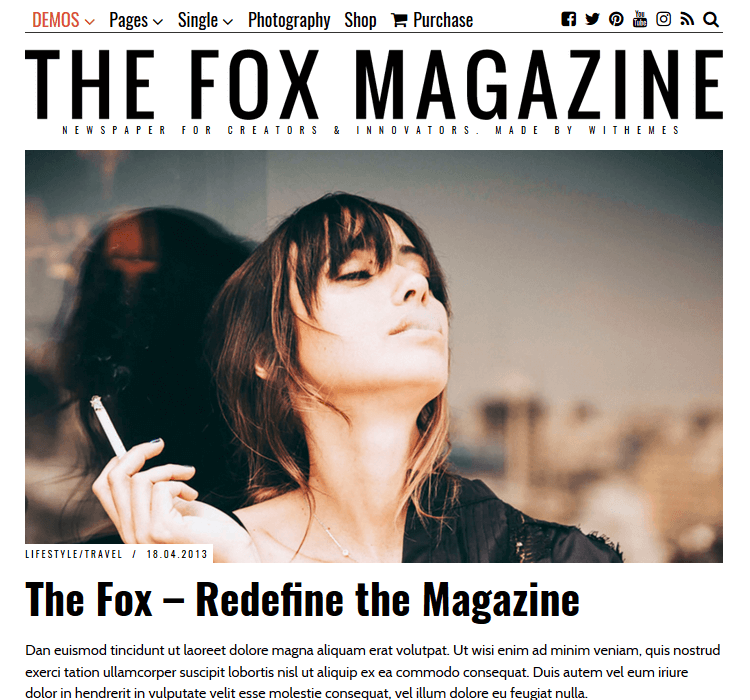 The Fox redefines what a WordPress magazine theme should like. With multiple layout options for configuring any type of blog – standard, grid, masonry, or a list type – and over 100 customization options for changing things like your logo, color scheme, background image, and even font style, The Fox is great for personalization. Utilize the “Quick Translation” module to translate your content on the fly, divide your blog into 2 columns for a real-life newspaper look, and even highlight your best post’s so readers know exactly what to view first. In addition, The Fox has an amazing gallery option that is easily created using drag & drop technology. You can even present images vertically for added visual appeal. The Fox also comes with social media integration for increased social sharing, SEO optimized for better search rankings, and sticky navigation to improve the user experience. Goodnews comes with three things in mind: the experience, interests, and aspirations of website owners. It is perfect for users of all levels and is multipurpose enough to accommodate all website types. For example, blogs, internet marketing, product reviews, and news websites. Your site will always read well, comes responsive by design, and works on all screen sizes. In addition, you can supplement your income using the smart ad system that is built directly into your theme. Build stunning slideshows using the included LayerSlider and Slider Revolution plugins, a large community of forum visitors using the fully compatible bbPress plugin, and stay in touch with readers by building a bigger email list using the MailChimp Newsletter widget. 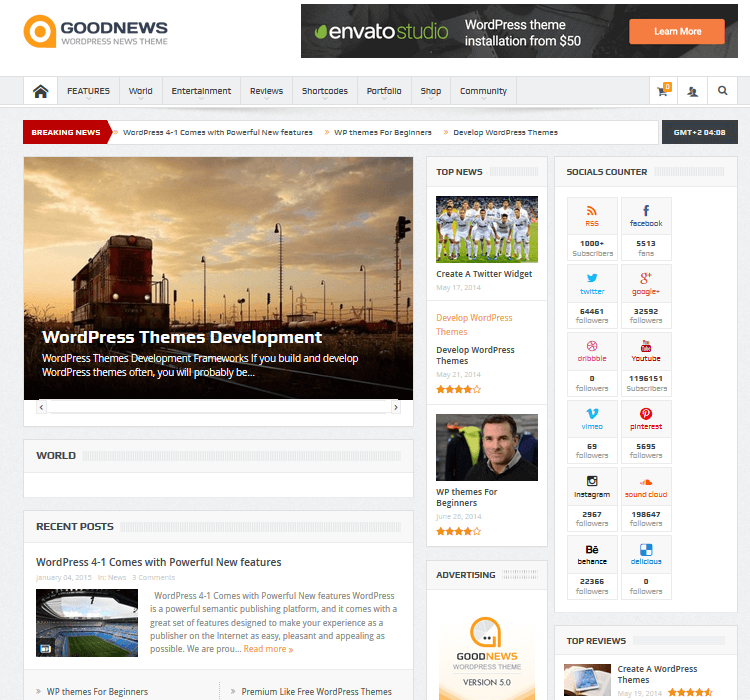 Lastly, unlimited sidebars, colors, and portfolio options make creating a standout website a cinch using Goodnews. 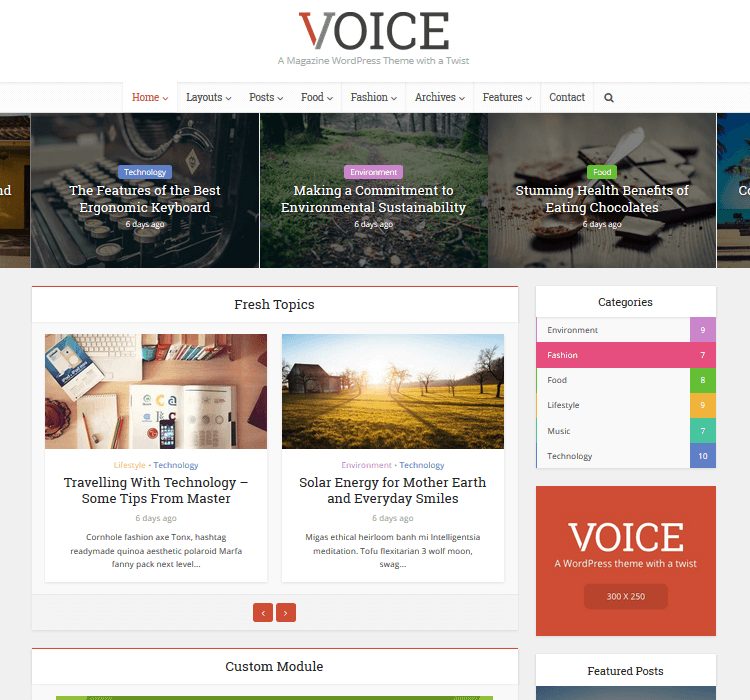 Voice is a WordPress theme that makes publishing easy and making money easier. With WooCommerce integration for building eCommerce shops, bbPress compatibility for building an interactive forum or social network, your magazine website will go from being average to amazing and all-inclusive. Highly customizable, you can change every site element including fonts, colors, typography, layouts and more, and see it all in real time. Built-in speed makes your website easily indexed and ranked in search engine results, and over 150 post listing combinations create an eye-appealing site your visitors won’t want to leave – improving your SEO efforts even more. Monetize your site with header ads and banners, create paginated posts for increased ad views, and even implement custom widgets like Easy Ads and Adsense for the ultimate supplement to your monthly income. True Mag is an exceptional magazine theme designed for websites with lots of video content. To help with your video content, True Mag offers features such as the Built-In Video Ads plugin, Short-codes for Video, Video Audio Play, Self-Hosted Video Support, and Front-End Video Submission capability. And what’s great is that this theme is responsive by design, focuses on perfect UX and UI practices, and comes SEO optimized as well. Additionally, this magazine theme is WooCommerce compatible, has powerful theme options for branding and personalization of your website, and has 3 different navigation options for crating the best user experience possible. Translate your content for international readers, build a social network using the BuddyPress plugin, invite site visitors to comment using Facebook Comment or Disqus, and even customize your mobile menu using the off-canvas menu or traditional dropdown menu. 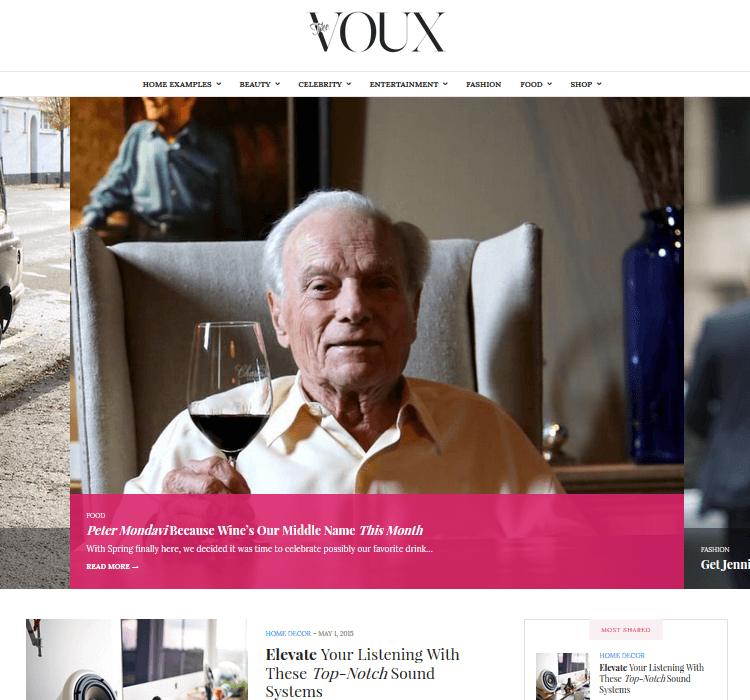 The Voux is a lightweight comprehensive magazine theme with a feminine feel to it. Start by utilizing any number of pre-made demos and get your site up and running in no time. Next, build an enticing online shop and encourage site visitors to make a purchase. In addition, allow visitors to share your best content by integrating social media share buttons, add an element of social proof with the social media counter, and clear out the social share cache periodically so your site is always up and running at optimal speeds. Choose from 4 unique headers styles, complete with a convenient navigation menu and personal company logo. More so, build your homepage to meet your needs and the demands of your readers using the included Visual Composer drag & drop page builder. Enable infinite loading so your readers never miss a single story, craft articles using a variety of page designs, and don’t forget to make your content available in different languages. 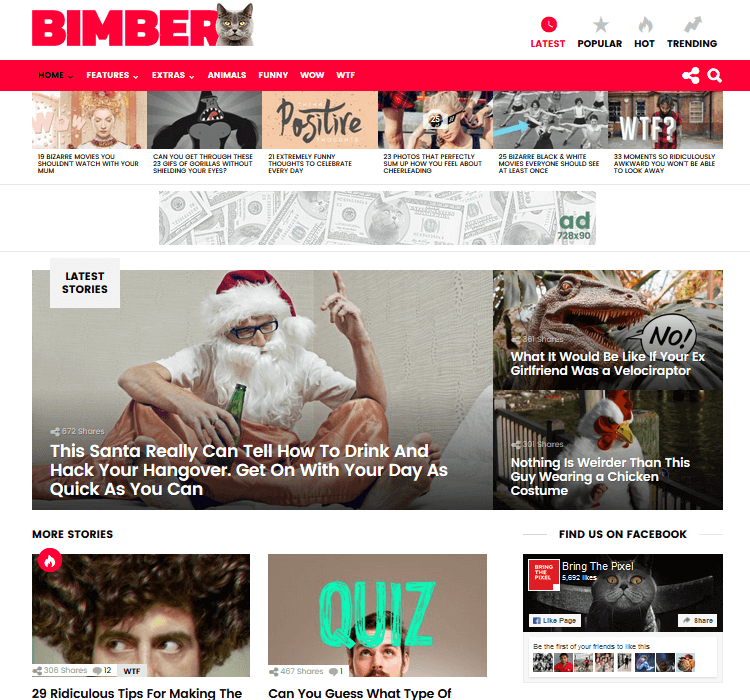 Bimber was created as as a fully functioning magazine theme capable of handling viral content. It is full of cool features such as the Visual Composer drag & drop page builder, 13 different post types, advanced font options, and Google AMP support. In addition, enjoy pre-made demo content that is installed in 1-click, easy customization of categories and tags for individual pages, and 7 unique header layouts for making a great first impression. With Bimber, you can also create complex Mega Menus for easier site navigation. Moreover, highlight your best posts at the top of your site and upload content to Facebook using Facebook Instant Articles. Additionally, you can create viral personality and trivia quizzes, enable Facebook or Disqus commenting systems, and even open up shop using the popular WooCommerce plugin for extra monetization of your viral magazine website. 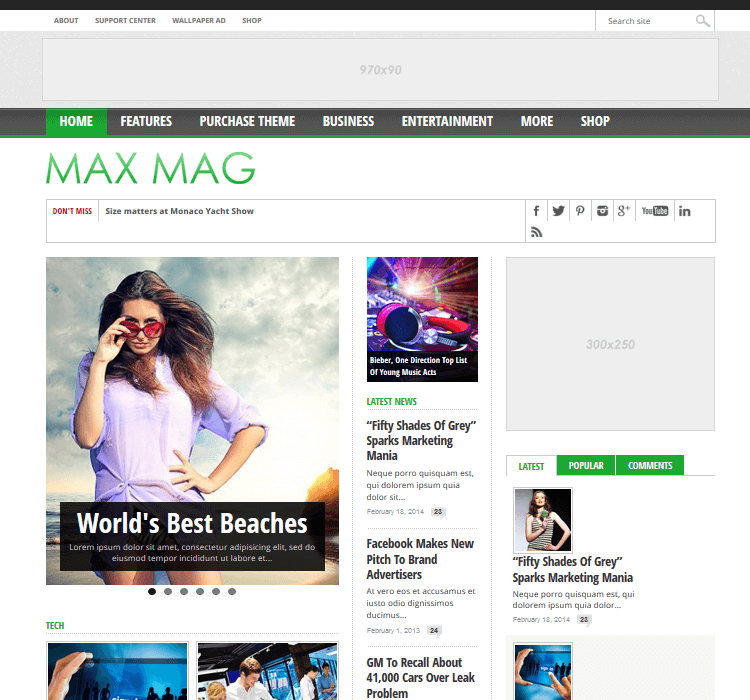 Max Mag is a professional magazine WordPress theme with cool features like WooCommerce compatibility, fly-out navigation ability, and a drag & drop homepage builder. In addition, it comes with 16 custom widgets, 4 different ad units (including a wallapaper ad), and unlimited color schemes for the ultimate branding of your website. In addition, you can enable the slider category pages for displaying recent posts, create teaser headlines so you can feature the breaking news of the day, and upload a custom favicon for brand recognition. Know that your lightweight theme will always run at optimal speeds thanks to clean code and HTML5 and CSS3 markup. More so, you can easily translate content for your global audience, create a custom background for added visual appeal, and enable threaded comments so your site visitors can pipe in with their opinion on their favorite stories. 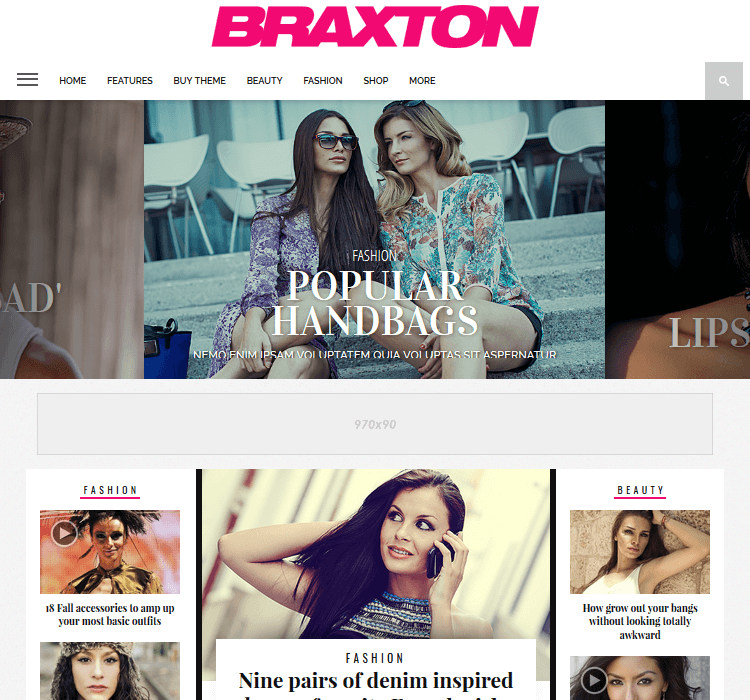 Braxton, a premier magazine theme with both design and function in mind, comes as a comprehensive theme package with a sleek and modern feel. Retina ready and fully responsive, all of your site visitors will be able to access your website no matter their device or screen size. In addition, they can participate in the forum you build using the popular bbPress plugin, shop your best products and service thanks to your WooCommerce shop, and of course engage with your best content thanks to the featured slider area focusing on top stories of the day. 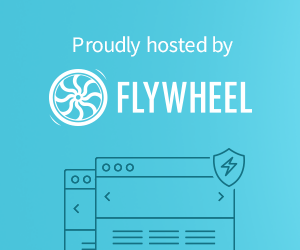 Enable fly-out navigation for a better user experience, infinite scroll so readers can view more content without interruption, and even add video and audio posts for those that prefer to see and hear what is going on in the world. Moreover, for those looking to monetize their website, take advantage of Brixton’s 4 separate ad units so readers can see your best product recommendations, without being annoyed. 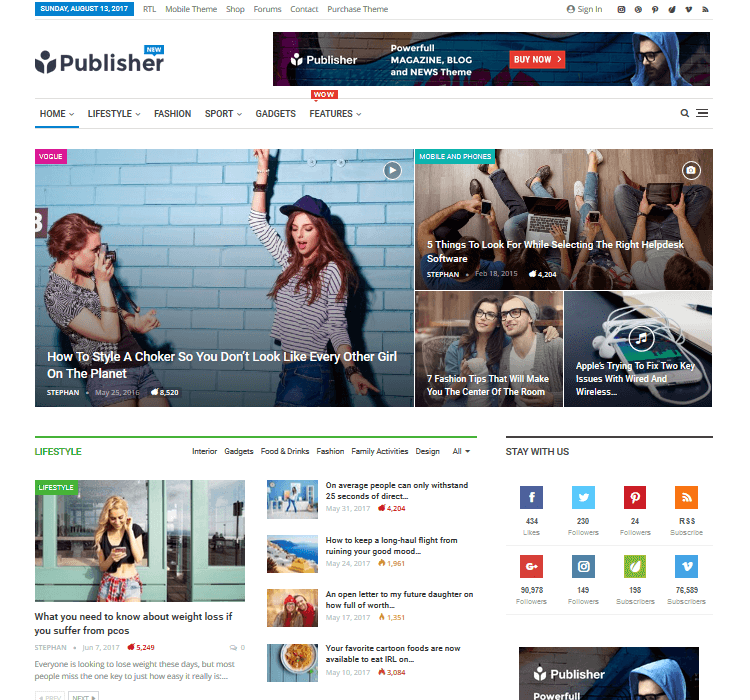 Publisher is a powerful newspaper, magazine, and blogging theme that pays close attention to all the details, offers an incredible feature set, and makes designing your website super easy with its intuitive interface. For example, translate all of your content using the translation panel, even enabling RTL languages, choose from over 200+ homepage demos for easy site building and inspiration, and enjoy automatic updates so your site is always running at its best. Create mega menus and use menu icons, and even include cool animation effects and responsive background images. In addition, utilize the advanced ads manager, choose from 8 different header styles, and customize your blog’s sidebars to match your individual site needs. Lastly, know that your theme, and thus your magazine site, is optimized for pagespeed and high performance, especially on mobile devices with Google AMP support. And there you have it. 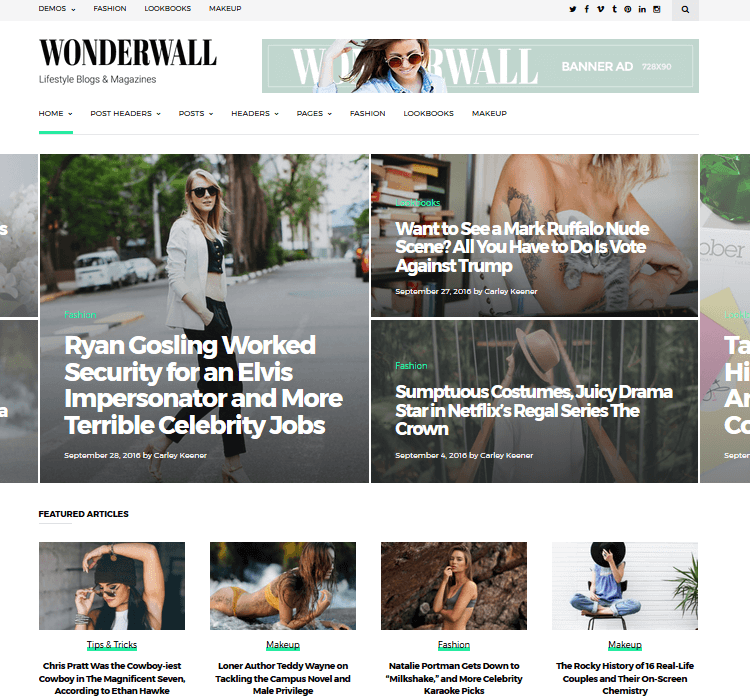 Some of the market’s very best WordPress magazine themes for your news, magazine, and blogging needs. With a huge variety of customization options, special features, and high performing functionality, there is sure to be a theme that suits your needs in this roundup. Have you ever used any of the above-mentioned magazine themes for your WordPress website? Have I left one off the list that you feel should have been included? I would love to hear all about it in the comments below!